For this month’s Maker Love post, I’ve chosen Scottish based designer and maker, Nikki McWilliams. Celebrating our nation’s love for a good old tea break, her witty and recognisable designs bring a playful edge to homeware. What better day to enjoy Nikki’s work than today, National Biscuit Day! Having lusted over Nikki’s quirky and delicious biscuit cushions for many months on Instagram, I finally got my hands on an array of tea time treats earlier this year. 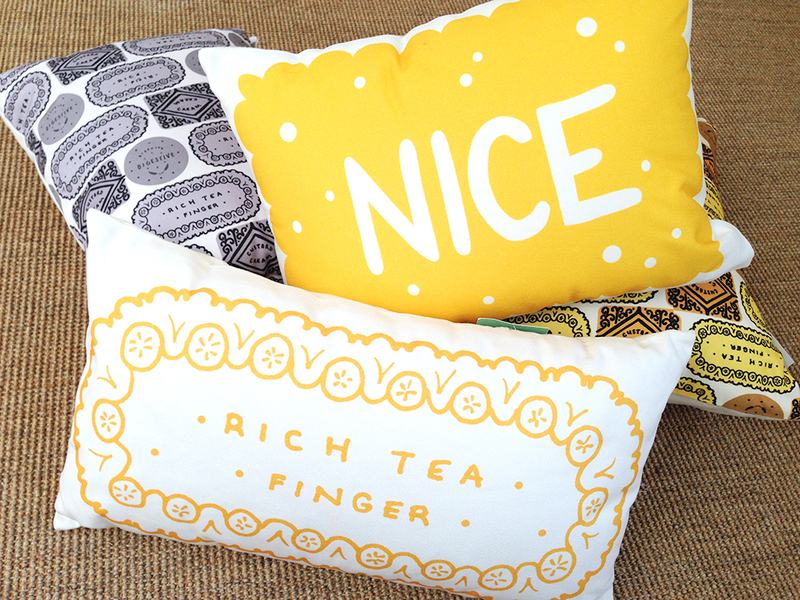 I’m now the proud owner of one Nice Biscuit Cushion, two Biscuit Mix Cushions, one Rich Tea Finger Cushion and a Custard Cream Print. You always think “that’s it now” until Nikki tempts you with another delicious looking delight! This entry was posted in Maker Love and tagged biscuits, bourbon, cushions, custard-cream, illustration, maker-heros, maker-love, nikki-mcwilliams, rich-tea, tunnocks. Bookmark the permalink.